Playdough is big around here! I have a super easy recipe and probably make it about once a month. We’ve used it for sensory play with spices and sprinkles, for mortar for engineering projects with blocks, and for all kinds of kitchen play! The other day I bought new gel colors and found that Betty Crocker has come out with a set of four “Bold Colors” that include black and brown! Time for some chocolate/dirt colored playdough! 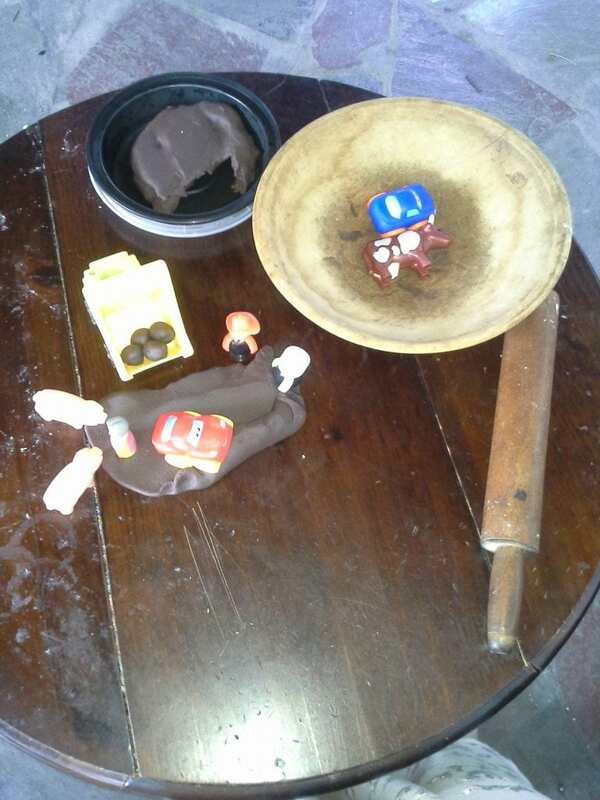 One of the things that helps keep playdough a fresh exciting medium is my providing new invitations or provocations for sensory exploration or imaginative play of some kind. 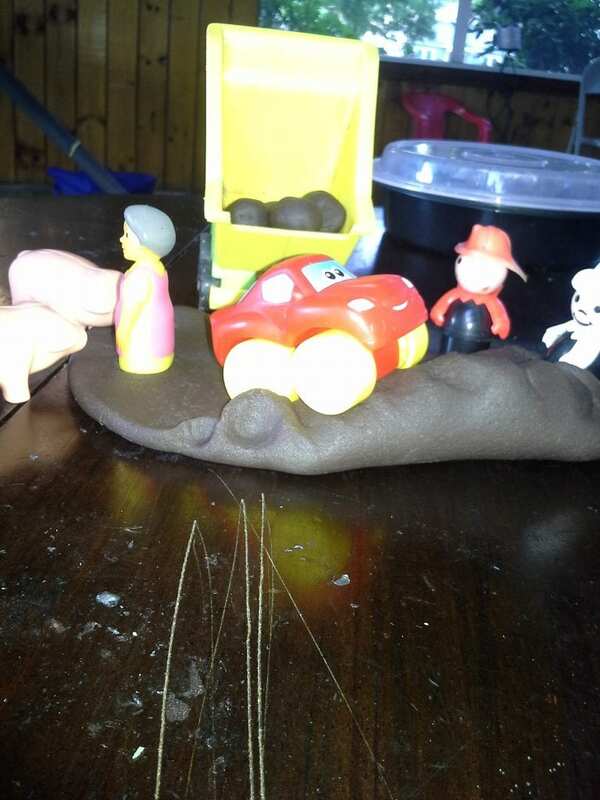 This batch of playdough came out a lovely dark brown color and reminded me of road dirt! 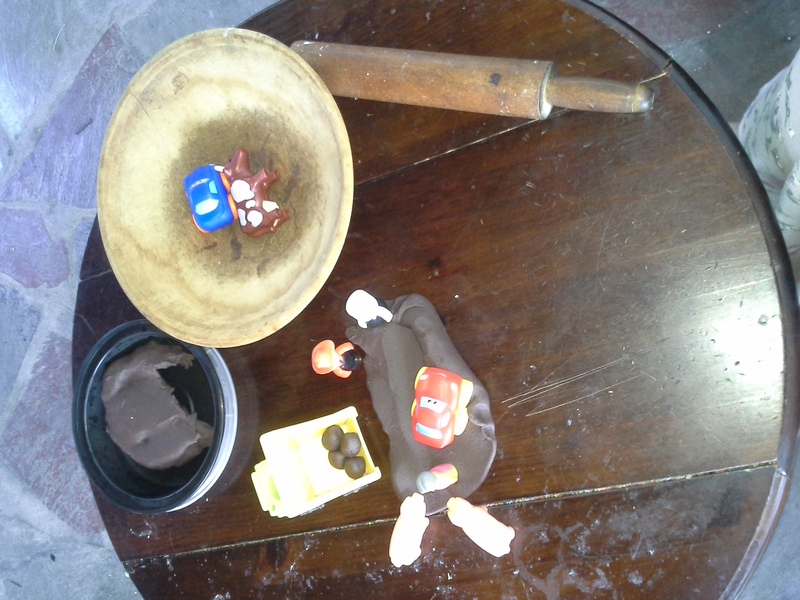 The children have a little table on the porch where they do playdough (what am I going to do when it’s winter and the porch is too cold?) so I set up a little invitation for whoever wanted to play! 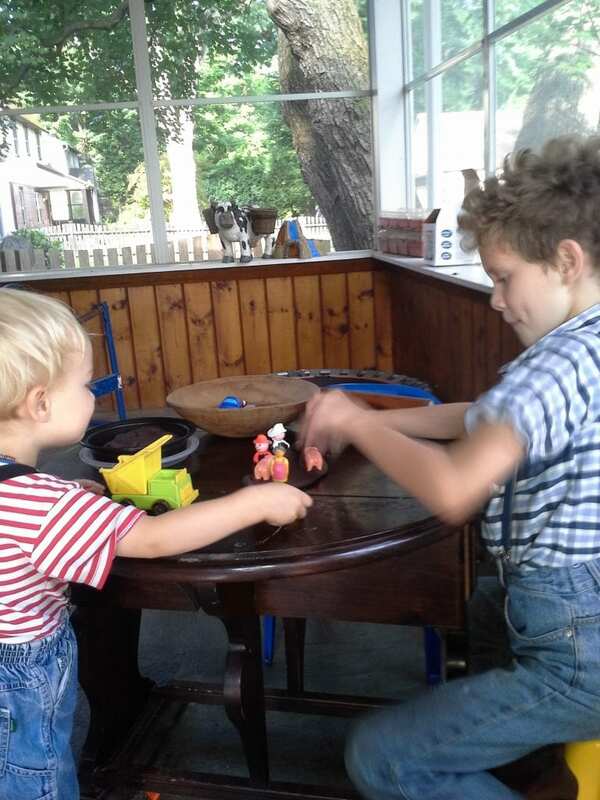 I figured it would be Jack and Bull- they’re the two who love trucks the most- but actually Buggle was the one to join Jack at the playdough table! 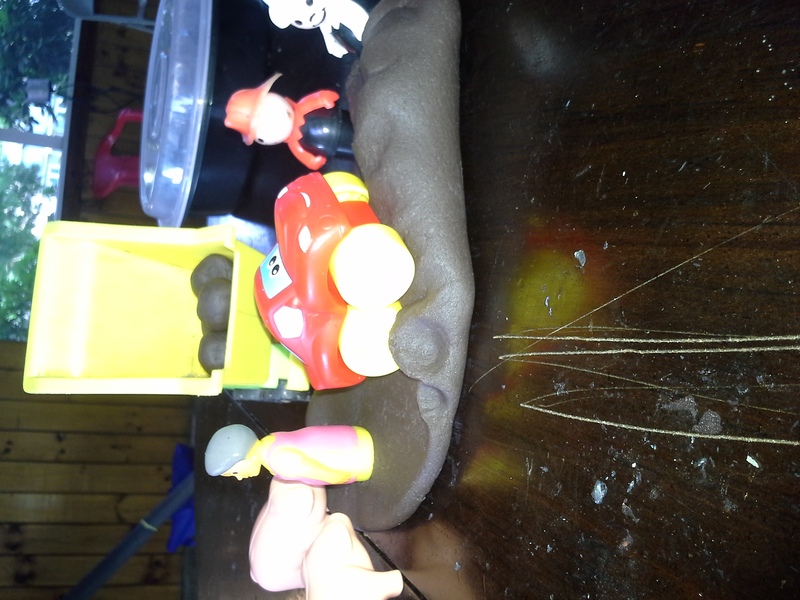 I had removed all of the regular playdough toys except the rolling pin and set up the beginning of a road building scene- then put some additional trucks and people in the playdough tools bowl. 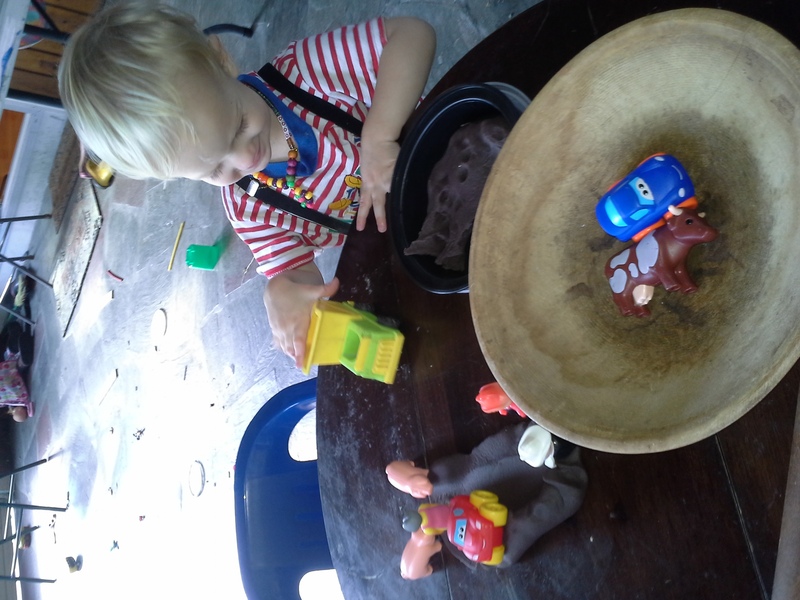 Jack went right to the dump truck and started dumping the “boulders” that were in it then trying to make his own from the playdough lump (excellent fine motor skills building activity). He chattered and talked about what the truck was doing “Vroom, beep, beep, dumping!”. 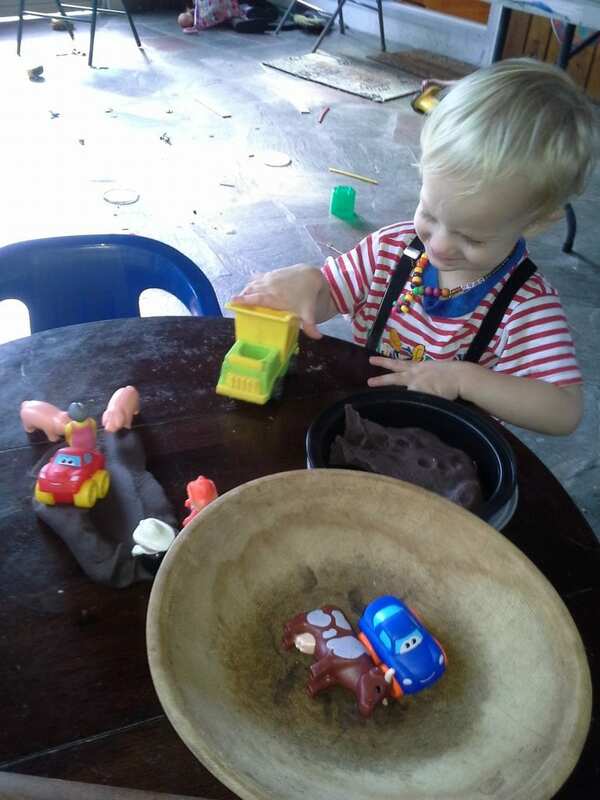 It was a good combination of imaginative, small world play and sensory play and he has gone back to it several times since so it was also horizon broadening as far as the use of playdough as a medium. Buggle started experimenting with how to drive the trucks through a resistant substance. He got some wooden slats from his workshop and experimented with using the playdough to glue them to the table to make a stable roadbed. ?While doing this he gave a running lecture to Jack on what he was doing and why. No truck noises, ?no imaginative play, just experimentation, testing, redesign and more testing! So typical and while he has not played with the playdough again, we have had several conversations that make me think, he is thinking about how such a soft, resistant substance could be used or dealt with in the real world. It is so fascinating to me to see what happens when I provide the right starting point. So often it doesn’t go how I thought it would, but so often I see the knowledge gained being assimilated and then applied somewhere else! I get another little glimpse into how the children’s minds work and am fascinated all over again! 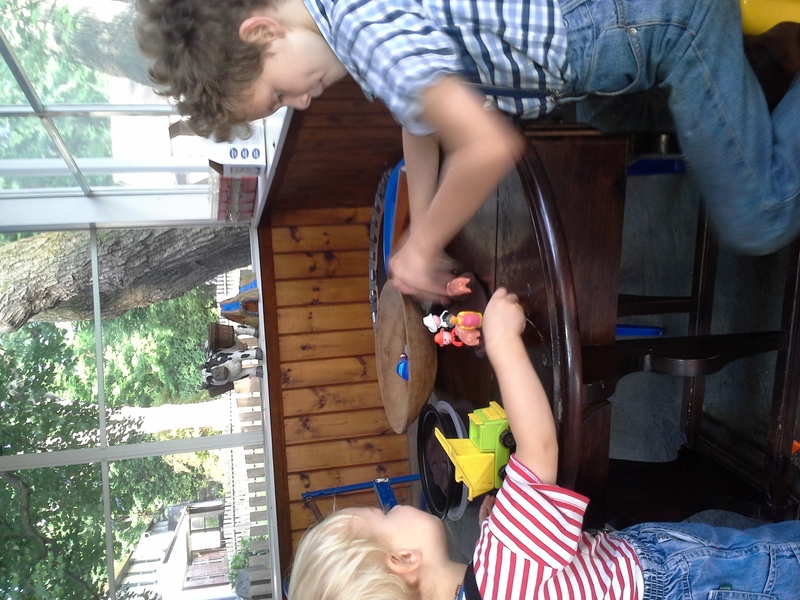 This entry was posted in Creativity, Elementary Education, free play, homeschooling, preschool educcation, Uncategorized and tagged Elementary Education, Emilia Reggio, Fine Motor Skills, free play, imaginative play, invitations and provocations, Montessori, sensory play, small world. Bookmark the permalink.